What to wear! The age old question. 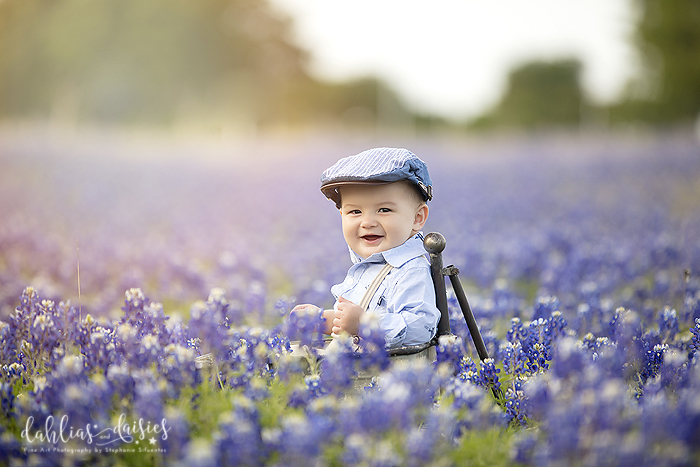 This post here is very specific Bluebonnet in April! Solid whites – Why? If your session happens to be one of the earlier session you will GLOW! It won’t be pretty, trust me. Plus in certain weather conditions the camera can see right through that cute white cotton shirt! I’m not that kind of photographer~! Solid greens – Why? In many locations, like the arboretum and the wildflower fields you will blend right into the background and looking like a floating head! Solid Blacks – Why? You will create a void. And unless the rest of your family is wearing back you will stand out. And if the rest of your family is wearing black they will look like floating heads and hands next to you! Plus it’s spring!! It’s all about color! Church clothes – Why? My sessions are laid back and fun. You will need to get down on your little ones level to interact with them. You will be sitting on the ground, kneeling squatting, rolling, and maybe crawling if you have a live wire! Be comfortable. We are going to have fun and not do a lot of stiff posing. Large ribbon bows – They will create horrible shadows across your beloved baby’s face! We need to see those happy eyes!! If you really must, bring one, but other wise check with me. I have hundreds of fabulous head pieces made for photography. I can match just about anything! Clothes that fit – This one should be obvious, but it’s happened to many times not to include it. Clothes that fit! Many people wait until they get to the session to try on the clothes and they no longer or never did fit. Please try on the clothes BEFORE the day of your session! Colors! - Because it’s spring and you can! But remember, no neon colors! 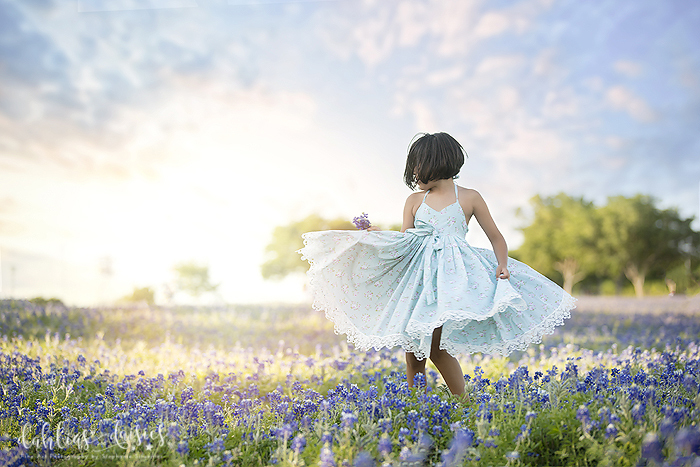 For bluebonnets I suggest bright BOLD colors. Reds and yellows look amazing in a sea of blue! You really can’t go wrong with suspenders, hat and a bow tie one a little man! Ever. You will have time for about 3 clothes changes during your session. That doesn’t mean you have to change clothes 3 times, it just means you will have time to. Go for different looks. Something sweet, something sassy, something classy! Sooooo, April. It’s freaking windy in Texas in April. Last year felt like a monsoon. The year before that wasn’t quite as bad, but we never know what to expect until it happens. Everyone’s hair blowing around causes serious editing delays so please do what you can to control this (I know easier said than done!). The best thing you can do for yourself is spraying hair spray over your hair regardless of if you normally use it or not. If you hair is straight, spray and hand then brush it down. We are using this to control fly always more than holding a style in place! IMPORTANT – SHOES. Parents if you are not getting your picture taken please wear tennis shoes and dress comfortably! Work out clothes are grrrreat! You will get your cardio in during this session! Do not wear any kind of flip flops or sandals. There are ant piles and burrs in some of these fields. While we do an excellent job of keeping baby burr and critter free, if you aren’t watching out for yourself (and chances are you won’t because you will be watching baby) you might just step in one of these ant piles. It’s happened! If you have shoes you are dying to wear just come in something safer and change into them when it’s your turn to be in pictures. Same for babies that are able to stand. Hard soled shoes with closed toes. The flowers are high and we will not be able to see the shoes. When they are sitting on props we will most likely be taking shoes off… because lets face it. The bottom of your baby’s foot is MUCH cuter than the bottom of those shoes! Family pictures. Don’t match, but coordinate. Pick colors from the same color group and run with that! Another great idea is to pick one color and pull it through with everyone. Just a touch I love how the family below was able to do that. I tell people for family outfits, throw them all in a pile on your bed (or at the store). If one stands out more than the others put it back and find something else. We don’t want one person drawing attention away from the family as a unit. I always show up to spring sessions with a full wardrobe in tow! I do tend to look at the sizes of the children coming that day and bring things that fit them. You are welcome to these boutique outfits or you can just wear your own! 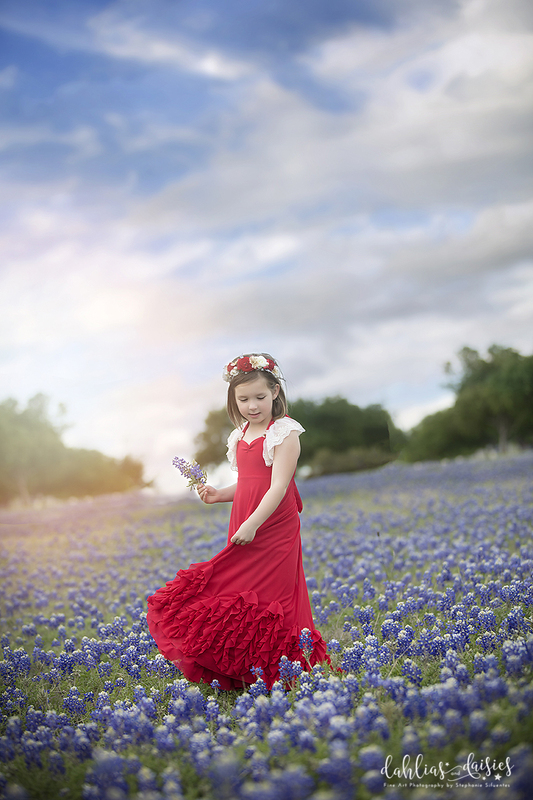 I tend to keep bluebonnet props a little more minimal compared to wildflowers. This year I will have a few new sets for the little ones! A beautiful wooden wishing well and a matching wagon that will be filled with flowers and other items! I will bring the usual staples like the ladder and a chair plus whatever I’m feeling that day. You are always welcome to request a certain props! I send out the location to the field 1-2 days BEFORE your session. This is to ensure that you show up at the right field. I have had to change filed at the very last minutes and the only way to ensure that you show up at the correct place! For planning purposes, the fields are usually locations near Renner Rd and George Bush. Please be sure to check your email before you leave for your session. I do not shoot in rain or dark cloudy skies. I want your pictures to look amazing and that requires specific weather conditions for the camera to be able to focus correctly. If there is any questions about the weather please check your email. I will often ask if there is a specific time you’d like for me to make a call one way or another. I do have certain days of the week reserved for weather event makes ups!